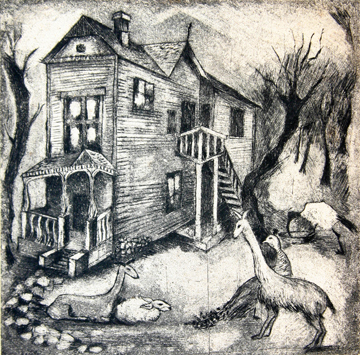 FWWeekly: Feature: Wanna See My Etchings? �The Collector� by Kelly Fearing exemplifies the Fort Worth Circle�s infatuation with fantastical scenes featuring people and animals. �Woman Combing Her Hair� by Bror Utter was painted in 1945, a year of prodigious output by the Fort Worth Circle artists. 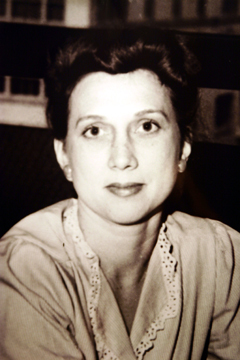 One of the few photographs of Veronica Helfensteller, among Fort Worth�s best printmakers: �She had coal black hair and black eyes, and she was a striking woman with lots of personality. Photos of her are even more rare than her art work,� gallery owner Greg Dow said. �Zookeeper�s House� by Helfsensteller. A mid-1940s engraving by the raven-haired Fort Worth resident who kept a printing press in her house and hosted weekly soirees with Fort Worth Circle artists in the 1940s. 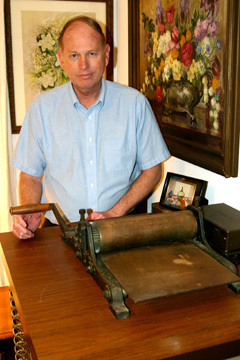 Scott Barker, one of Fort Worth�s most knowledgeable art historians, owns the press that Sam Ziegler used for printmaking in the 1930s. 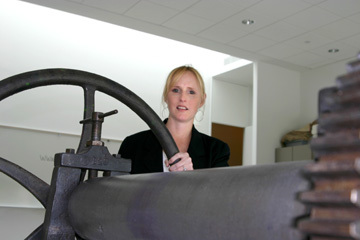 Modern Art Museum of Fort Worth�s Kendal Smith admires this heavy-duty Sturges press, one of only a handful in existence when it was given to Blanche McVeigh in 1942. She willed it to the museum in 1970, and the press is still used in workshops. �Building the New T&P Station� from 1931 and �Sinclair Building at Night� from 1932. Sam Ziegler created numerous etchings of early Fort Worth architecture and landscapes that give historians a unique glimpse into the past. �Wild Beast� by Bror Utter is as close to a cowboy painting as the innovative and often avant-garde artist ever got. He and his contemporaries generally abhorred the realistic Western scenes that traditional Fort Worth artists and collectors favored back then. Fort Worth�s print artists from the first half of the 1900s are drawing the eye of art connoisseurs. �Woman Combing Her Hair� by the late artist Bror Utter is a gothic hoot. 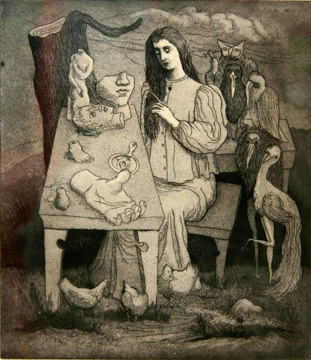 It shows a seated woman combing her hair, looking at a large, severed hand and a tiny foot on a table in front of her, flanked by various kinds of birds. Art collector Scott Barker pulled it down from the wall of his living room to give a visitor a closer look. The fact that Fort Worth artwork is becoming a hot item among collectors on the East Coast is due mostly to Utter and a small group of local artists who took off on an adventurous romp into abstract freakiness about 60 years ago, back when the world wasn�t watching and few knew that such art could exist south of the Red and west of the Sabine. At the time, more cosmopolitan cities such as Dallas were only tiptoeing toward modernism. It might seem surprising that a collector such as Barker, who owns large and valuable paintings from some of the city�s most noted early artists, can get excited about a small black-and-white print. A print! Who cares about prints? Turns out, a growing number of folks are getting the bug, and Fort Worth�s short but stellar list of mid-20th-century printmakers is garnering attention these days. Early, original, handmade prints by Fort Worth artists are just as scarce as locally done paintings from the same period. Many focus on historic scenes and appeal to people who get excited about seeing how downtown�s skyline has evolved, or what an old building looked like in the 1920s or 1930s when it was under construction, or how Main Street looked with a line of Model T Fords parked alongside its curbs. While not as eye-catching as paintings, they nonetheless appeal to collectors who love art but have limited pocket money. Dallas was fertile ground for printmaking, and a celebrated group of artists known as the Dallas Nine were remarkably productive from the 1930s to 1960s. Jerry Bywaters and Alexandre Hogue created a guild called the Lone Star Printmakers in 1938, and they and other artists such as Otis Dozier and Merritt Mauzey cranked out limited runs of original prints and sold them for $5 to $8 at traveling exhibits across the state. Women artists such as Lucile Land Lacy and Coreen Spellman formed their own group, The Printmakers Guild. Many of these prints survive today, and a devoted collector base has driven up prices in recent years. But in Fort Worth, printmakers weren�t nearly as organized; they tended to do things as much for fun and fantasy as for fiscal fitness. Dallas artists favored lithography with its high-quality prints, but there weren�t any of the expensive litho presses in Fort Worth. The artists who later became known as the Fort Worth Circle leaned toward the simpler etchings, since several of them owned their own hand presses. As a result, the prints are relatively small in number, difficult to find, and often groundbreaking in spirit. And not surprisingly, that�s inspiring collectors to hunt them down like eager bloodhounds. �I can�t think of anything comparable to what was happening in Fort Worth,� said Jane Myers, senior curator of prints and drawings at the Amon Carter Museum. �It was unusual to have progressive artists of their ilk during the 1940s in Texas.� More than two dozen etchings by the early local printmakers will be displayed at the Carter as part of a Fort Worth Circle exhibit early next year. The tidy, bespectacled man who arrived by train in 1917 was a rarity in Cowtown. Samuel P. Ziegler, 35, had been well schooled in music and fine arts in Pennsylvania, with an extensive tour of Europe under his belt when he came to teach music at the fledgling Texas Christian University. He would eventually become head of the art department, a post he held for 27 years, and create a dazzling series of etchings featuring the churches, large buildings, street scenes, landscapes, and various construction and demolition projects at a pivotal time in the city�s history. He sketched scenes and then took the drawings home and made prints of them on his small press. In the art world, �original print� is not an oxymoron. It describes the process of transferring reverse-image sketches onto a plate, applying ink, and then transferring the image onto paper. Prints were generally limited to small runs of 10 to 100 copies, signed and numbered. It was a way to sell art more cheaply during the Depression and the post-World War II years. Old-style printmaking is time-consuming and exacting, and in some ways requires more skill than painting. Taking original paintings or drawings and engraving them in reverse onto flat surfaces made of metal, wood, stone, or any number of materials was a chore. The effort spent on each print and the variables involved when applying the ink made each etching unique. The process is a far cry from photographic and digitalized modern printing methods where thousands or millions of high-quality prints of an image are cranked out with ease. Ziegler�s body of work fills spaces in Fort Worth history left empty by photographs and other records. 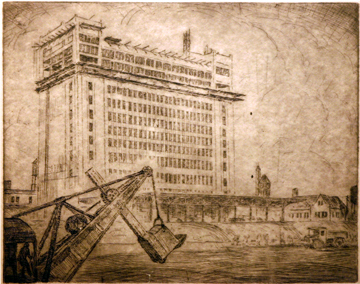 He provided an artist�s eye and sensitivity, and his etchings give the city�s early-20th-century era some personality. Etchings are fragile by nature, and many have been lost or ruined over time. But Ziegler�s descendants still have some of his works, and Barker, a founding member of Collectors of Fort Worth Art, is among his most avid fans. For instance, in 1931 Ziegler made an etching of the new Texas & Pacific train station as it was being built and the old one being torn down. One image depicts the new station rising in the foreground, while the tower of the old station is seen in the distance. �I�ve never seen it anywhere but in this drawing,� Barker said. 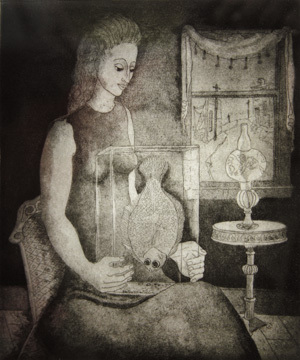 Another local artist, Blanche McVeigh, followed Ziegler�s footsteps in the 1930s and eventually surpassed him for sheer number of etchings. She too kept a small press in her house, but later became one of the few people in the country to own one of the new Sturges presses, so heavy and formidable that McVeigh was forced to shore up the floor of her pier-and-beam house to keep it from crashing through. She later built a house with a concrete floor specifically for her press. She willed the 1500-pound behemoth to the Modern Art Museum, and it is still used in workshops. McVeigh�s etchings gravitated toward African-American subjects in later years, and she experimented with aquatinting, which added color but greatly increased the amount of time it took to produce a print. She sold many of her earlier works for $3 each. Later, her prices rose to about $15. �She wouldn�t even have been making 25 cents an hour,� Dow said. By the autumn of her career, McVeigh was considered one of the top etchers in the state. Yet, like most artists, she couldn�t make a living solely through her craft, and relied on income from her picture framing shop. Eventually, some of her prints featuring African-Americans came to be viewed as almost condescending, after society�s attitudes began to change, and during the 1960s McVeigh reportedly downplayed those works, even refusing to display them in her shop. Today, those prints are most sought after by collectors and can bring $1,000 or more, compared to her earlier architectural renderings that might fetch half that amount. In the mid-1940s, a small group of Fort Worth artists who liked to drink wine, smoke cigarettes, and discuss techniques and theories began gravitating toward an abstract style that was rare among Texas printmakers. Veronica Helfensteller, Kelly Fearing, Dickson Reeder, Flora Blanc, Bill Bomar, Cynthia Brants, and Bror Utter were among the most daring. All were painters of talent but became collectively enthralled with printmaking and challenged one another to see how imaginative and vivid they could get in their work. They trained at some of the world�s best art schools � in New York, Chicago, and abroad � but settled in Fort Worth and stretched the traditional regionalist style to new dimensions. One of the most bewitching of the Circle�s members was Helfensteller, whose good looks and penchant for spooky and absurdist etchings made her stand out even among her collectively sophisticated group of friends. She asked anywhere from $5 to $15 for her prints, which wasn�t chump change. 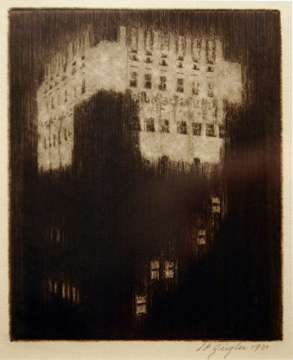 Helfensteller hosted weekly printmaking sessions at her house and allowed the other artists to use her press. They played classical music on the record player, worked into the wee hours, critiqued one another�s work, experimented with new techniques, and spurred themselves to new levels of abstractness. The last survivor of these long-ago meetings, Fearing, recalls them as a magical time in the waning days of a world war, a time of inventiveness and exuberance. Some nights they put aside their experimental engravings and, helped by the sherry they all adored, broke out into impromptu dancing. The godmother of local engraving, McVeigh, sometimes stopped by to pass along pointed advice to these mavericks. Another occasional visitor was one of Dallas� leading engravers, Otis Dozier. There wasn�t a market for their bizarre works, and many remain with the artists� heirs. 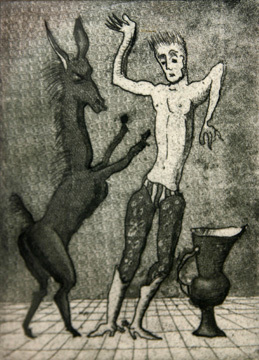 Fearing gave his prints to the University of Texas at Austin, where he taught art for 40 years. While that type of hoarding makes the items more rare on the open market, it can also hurt their value. For collectors to get excited and create a buzz about an artist, they must be able to find their paintings and prints at auctions and estate sales and then hang them on their walls and talk about them and inspire other collectors to seek out their works. This growing demand then heats up the value. Barker sees that phenomenon slowly playing out now as more people start to appreciate the Fort Worth Circle�s unique place in the state�s early art scene. Myers, at the Amon Carter Museum, has already seen an increased interest. �Major print collectors on the East Coast are collecting Fort Worth prints now because there is a greater appreciation for major printmaking of the period, and the quality of the Fort Worth works merit attention,� she said.